Dave Birkett of The Detroit Free Press expects D.J. Hayden to open the season as the Lions’ slot corner. Prior to signing with Detroit this offseason, former first-round pick Hayden had been a disappointment. Three of his first four seasons ended with him earning a “poor” grade. 2014 was his highest-graded season (67.6 overall). In 2016 Hayden primarily played slot corner for the Raiders and earned an overall grade of just 48.6, the 96th-best grade among 111 eligible corners. Hayden allowed 1.37 yards per coverage snap when defending the slot in 2016, which ranked 40th out 52 cornerbacks with at least 140 coverage snaps from the slot. 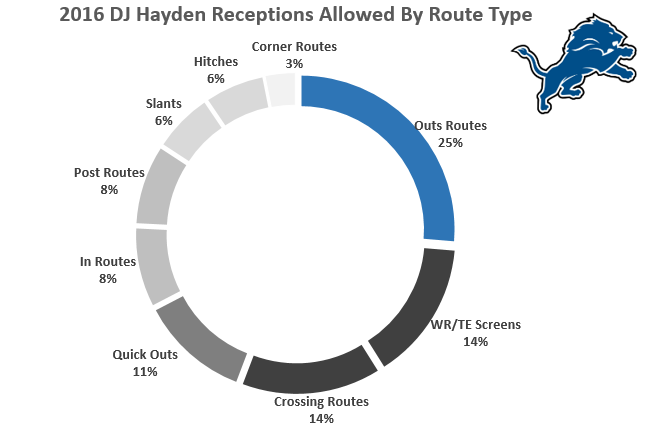 Hayden gave up a reception every 7.8 cover snaps from the slot, which also ranked 40th. Hayden has slightly better numbers when defending the slot — 1.2 yards allowed per coverage snap, 8.6 coverage snaps per reception, and a passer rating against of 101.2 — compared to when he is lined up outside — 1.5 yards allowed per coverage snap, 8.2 cover snaps per reception, and a passer rating against of 106.4.